My husband and I chose Costa Rica for our honeymoon back in August. It was not an easy compromise at first. Originally, I wanted to go to Egypt and he wanted to go to the Bahamas. Since we were married during hurricane season, I wasn’t too keen on going anywhere that could be in the path of a tropical storm. We talked about the things we wanted to see and do in our respective choices and settled on Costa Rica as a good middle ground. It offered the adventure that I wanted and the beach relaxation for which he was looking. When it came down to the details, my husband Landry was away in China when I came across this amazing TravelZoo offer: A seven-night getaway for two that included airfare, hotel accommodations, and a rental care for just $599 per person! Well, it turned out to be a little more than that because of where we were flying out of, but when all was said and done, our entire honeymoon cost just under $1,700. Getting everything booked was a bit of a challenge since he was in China and there was a 12-hour time difference between us. I called the travel agency to get more details, then I e-mailed everything to him to review, and he called me back via Skype at midnight to confirm everything before I went ahead and booked it the following morning. After all the craziness of a year of wedding planning, booking our honeymoon felt like the greatest thing on earth. In terms of details, we couldn’t have found a better mix of the things the two of us wanted to see and do. Our trip started out in San Jose, where we picked up our rental car and made the trek across many serpentine roads to the Arenal Paraiso Resort and Spa, right at the base of the Arenal Volcano. Our first three nights were spent inland, waking up every morning to the amazing view of a volcano right out our front window. On our first full day in Costa Rica we went on a ziplining tour through the rainforest, a trip that was included in our vacation package. When we arrived at the resort, we were pleasantly surprised to find out that we were the only two people on the tour. Our guides were absolutely amazing. 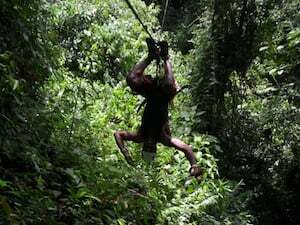 They taught us how to zipline and even let us do tricks like going down the line upside down and riding flat like Superman through the forest. They also pointed out all kinds of wildlife that we never would have realized was there. What a fantastic introduction to the beauty of both the land and people of Costa Rica! That night, we ventured into the town of La Fortuna for the first time. We wanted to find a place to eat authentic, non-touristy food. We came upon a man on the street who was actually trying to drum up business for his restaurant, Los Nenes, which we never would have found on our own as it was a small out of the way restaurant down a narrow alley. The food was phenomenal and so were the prices. We ended up going back there for dinner the following night as well. 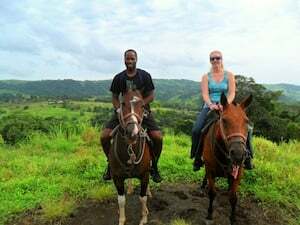 On our second day in Arenal, we went for a horseback riding tour along the base of the volcano and ventured up to a vista that looks up at the summit of the volcano, plus to a lake at the base. We were happy to find that once again our tour would be private, just us and our guide. We picked fresh guava from trees and ate them as we trekked through forest and pasture paths, watched cowboys heard bulls into pens, and even saw a wild horse as we crossed a small stream on our way back to the ranch. The rest of our time in Arenal was spent exploring the hot springs at our resort, relaxing at the spa over full body massages, and going out on hiking trails that led us to beautiful, pristine waterfalls. 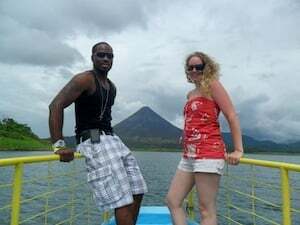 Arenal gave me exactly the kind of adventure experience I was looking for and my husband was thrilled that he was able to do so many new things that he he’d probably never have thought to do on his own. On our fourth day in Costa Rica, we headed out of Arenal on our way to Guanacaste Province, where we were to spend three nights at the Allegro Papagayo All-Inclusive Resort. As we drove out of Arenal, we came upon Arenal Lake, a huge manmade lake at the base of the volcano. I asked my husband to stop so I could take some pictures. I had heard a lot of people talking about the lake and we really hadn’t had the opportunity to see it yet. As soon as we pulled over, a man came to the window of our car and asked if we wanted to take a boat tour along the lake. We weren’t in any rush and the idea of getting to do another private tour was exciting. We followed the man down the bank of the lake to his boat. He took us all the way across the expansive lake to the very base of the volcano, all along the way pointing out wildlife and explaining how the lake came to be. He didn’t speak very much English and we don’t speak very much Spanish, but between the three of us we were able to communicate pretty well. Our tour lasted about an hour. On the way back, our guide even played us a little Costa Rican music. Before we knew it, we were off again, meandering through the lush green landscape on our way to the beach. Our resort was set out far away from any other towns or stores. It was a bit rainy when we arrived and there weren’t many people around since it was midweek. We found solace in the fact that our resort was even more private that we had expected. We spent most of our three days at the beach relaxing poolside, having drinks at the bar, and eating from the tasty buffet. On our second-to-last day, we went on a snorkeling trip, where once again, we had a private guided tour through the reefs. We were able to spot rainbows of different fish, horseshoe crabs, and even a little shark. It was amazing how much the landscape at the sea bottom changed as we swam from area to area. I’d been snorkeling several times before, but it was my husband’s first time. He loves going to the aquarium in Camden, NJ and I knew this would be an amazing experience for him. It may have been his favorite experience of our entire honeymoon. That night we got dressed up and had a private candlelit dinner on the beach thanks to a special wedding gift through our registry. Our server provided impeccable service and made sure that we had plenty of privacy. He also ensured that our glasses were never empty and the food kept coming. He was a native of San Jose and since we were leaving the next day to head back to San Jose, he gave us a rundown of places we should check out near our hotel. On our last morning in Guanacaste, we decided to check out of the resort and take a drive to some other beach towns before heading back to San Jose. We parked our car and took a walk on a pretty crowded beach in a nearby town. We ate these amazing ices sold by a vendor right on the beach that consisted of shaved ice, cherry flavoring, milk powder, and condensed milk. It’s hard to describe, but they were so good! 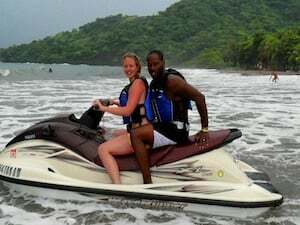 The only thing we hadn’t gotten to do yet that my husband really wanted to try was jet ski. Lo and behold, there was a family on the beach who rented out jet skis and boats by the hour. We went back to the car, changed into our suits, and for the next hour we were off and running, exploring the harbor on a jet ski. Everything on our honeymoon bucket list now seemed to be complete. Our hotel in San Jose on our last night in Costa Rica was beautiful. It was raining, so we didn’t get the chance to explore the way we had hoped, but we did do a short walk around the parks surrounding our hotel. The sites were beautiful even in the rain. On our last morning, we trekked around the streets of San Jose picking up last minute souvenirs that we’d been too busy to think about until that moment, hopped in our car, and returned it, just in time to catch a shuttle back to the airport for our flight home. In the end, I don’t think Egypt or the Bahamas could have held a candle to our experience in Costa Rica. The longer we spend away from it, the more we want to go back again. And none of it could have been possible without the gifts we received through our honeymoon registry. Not only did it pay for the base cost of our trip, but it allowed us to do the extras like the horseback riding in Arenal and the jet skiing in Guanacaste. We are so grateful to have used Traveler’s Joy and to have such loving and supportive friends and family that gave us the opportunity to make these amazing memories.